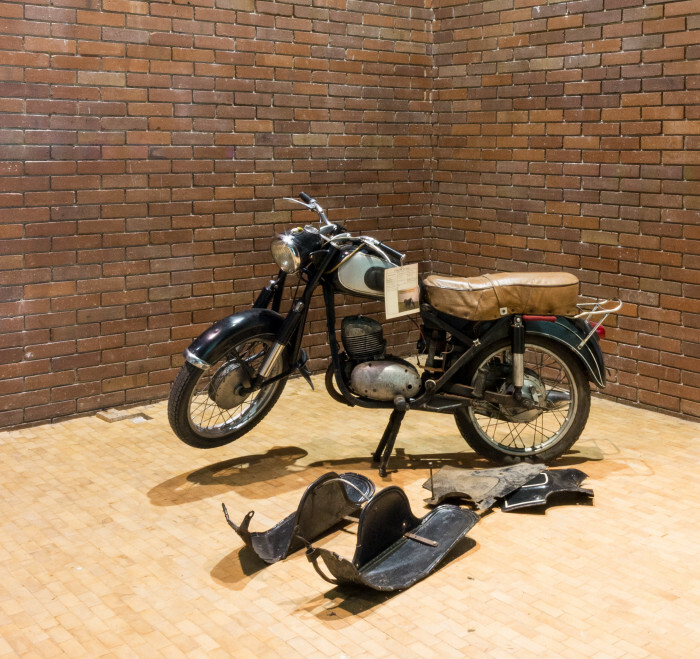 As a participant of 8th Young Triennale, I found a broken motorcycle in the warehouses of the Polish Sculpture Center in Orońsko. It was the work of Adam Rzepecki titled The engine of my art is SHL-ka. The motorcycle turned out to be broken, so I invited local mechanics to repair it during the exhibition. After removing the defects, I made the installation from the repaired motorcycle - it rides alone around its own axis. 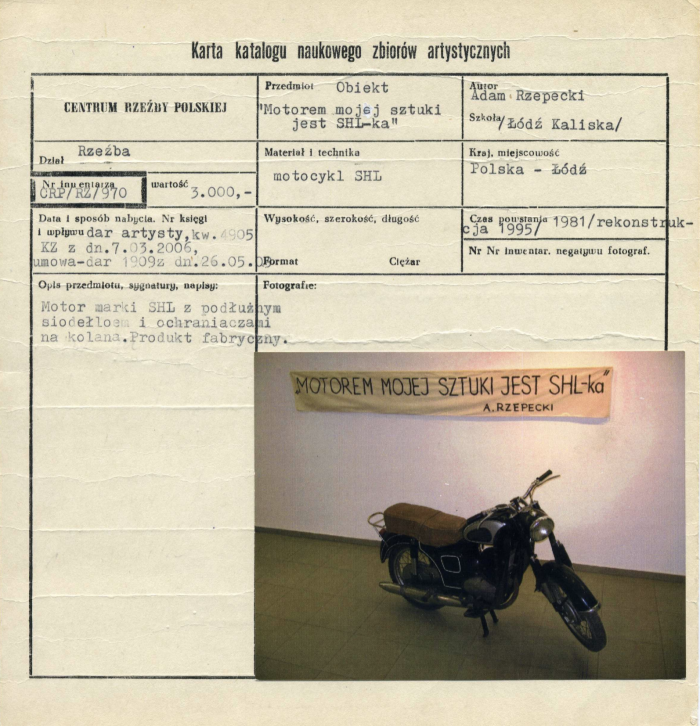 The official start of the motorcycle was a part of the Rusicka / Rzepecki exhibition at the Center of Polish Sculpture in Orońsko in June 2018. Thanks for cooperation in the repair of SHL-ka for Mr. Tadeusz Łyżwa and Sylwek Różyk from RetroCars. Index card of Adam Rzepecki's work The engine of my art is SHL-ka, Polish Sculpture Center in Orońsko. 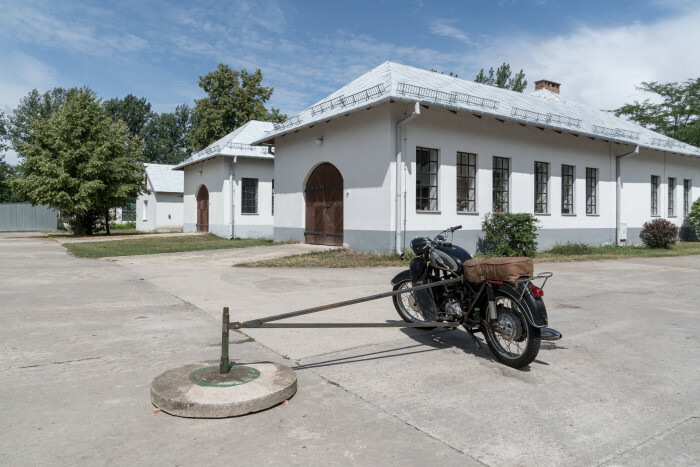 Motorcycle during repair, exhibition view, 8th Young Triennale, Polish Sculpture Center in Orońsko. Invitation to the exhibition Rusicka/Rzepecki, Polish Sculpture Center in Orońsko, project by Kasper Lecnim.